Why SP_RENAME returns the warning: “Caution: Changing any part of an object name could break scripts and stored procedures.” when renaming the column name? 2) Why SP_RENAME returns the warning: “Caution: Changing any part of an object name could break scripts and stored procedures.” when renaming the column name? Basically, sql server returns this warning to alert us to update all the places wherever we are referring this column. 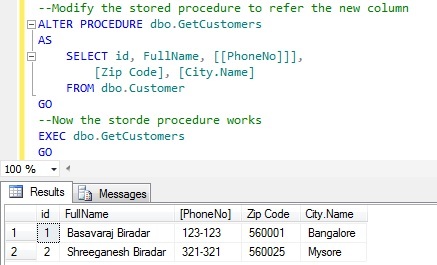 For example take a scenario where if the old column name is still referred in a stored procedure even after the column rename using sp_rename. In this scenario, the sp will start throwing error post the column rename. 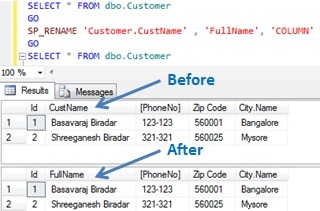 To avoid such issues, Sql server alerts us by returning the warning when we use SP_RENAME. 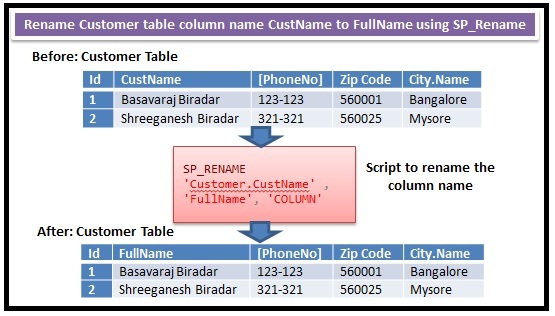 Renaming a temporary table column name is same as that of the regular table column name. Thanks you So Much!! 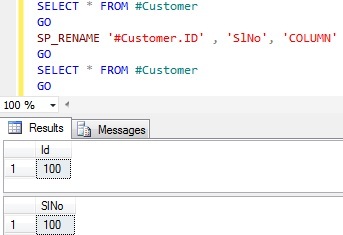 Had the same issue as #4 in your examples: Column Name with a Period in it and wanting to call sp_rename. Could not find another site that had as great of examples as yours.